Very good condition. A Tuck movable fold out panorama book, complete with all 17 original movable figures. 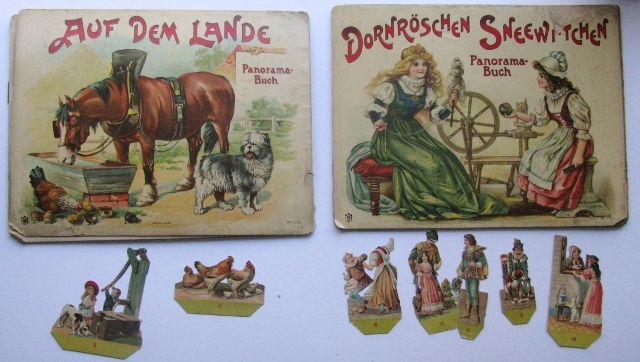 4 plates in concertina form that stand up to create a large panorama with 17 numbered loose figures of Nursery Rhyme characters kept in the attached pocket on the reverse.The die cut punch out characters fit into numbered slots in the panorama to complete the image, which consists of four hinged folding panels. On the reverse of slot plates is a story. Rear panel is designed as a pocket to hold the figures when not in use. On the verso of two of the panels, is the text for the two stories. Condition details – Very Good. All figures complete and in fine condition. Cover illustration has a small mark at right edge. An elf's arm has been reinforced on the back. The rear cover a bit marked by damp stain which does not affect the legibility of the "Directions" text. The tab which inserts into the rear slot has been expertly mended on the back. A tiny amount of loss at the deer at the third scenery panel – see photos.